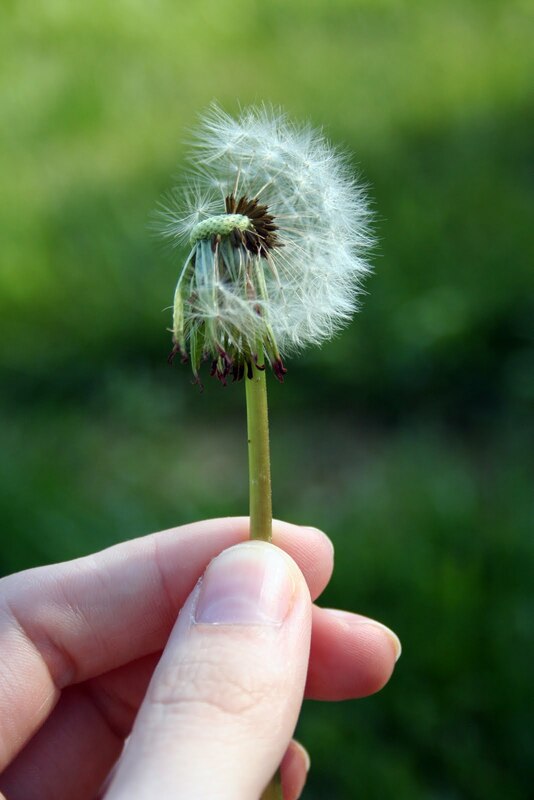 This time of year always evokes memories of childhood, when the dandelions sprout their magical white tips, each tiny seed with the potential to bring dreams to life. Memories flood back so quickly, and I remember hopefully making wishes in the warm spring sunshine. The innocent wishes of a child with so few cares, who still knew how to dream big. A girl who believed her life would mimic the books she carried with her in her black canvas bookbag. Who hunched over with scraped knees and plucked each snowy frond, deliberately blowing the seeds in her own front yard, even though she knew she wasn't supposed to spread the magical little weed. Eventually those childhood dreams morphed into new adult realities. We accept these realities, because what else can we do? But we make a mental note to teach our children to reach down with chubby fingers, and deposit their dreams on tiny magical seeds that drift off into unknown worlds. Or maybe, just maybe, someone will eat them. That is too funny!! He was probably proud of himself for getting rid of that darn thing! So true I love dandelions and making a wish, great pictures and love the last one, too funny! Oh Jaco cracks me up so much! What a funny pooch.